Have you found an online vendor selling Mezan Guyana 2005? I've become a big fan of the Mezan line of rums. They are unsweetened, uncolored, very tasty and affordable. This one is from the wooden double pot still which was moved from Uitvlugt to the Diamond Distillery in Guyana (where El Dorado rums are made), aged 10 years. A couple of swirls in the glass quickly dissipates the alcohol enough to let the tropical bananas and green and black peppers really shine. Delicious right through the finish. If the makers of El Dorado rum had produced this it would be colored brown instead of its natural, beautiful gold, it would be twice as expensive, and it would be laced with 30 grams of sugar. The folks at Mezan, on the other hand, do rum right. A delicious rum that is rum through and through but not a wow factor with a knockout flavour sadly decent cask rum ..
Beautiful light golden color for this distilled rum in a double pot still wooden from Port Mourant distillery. The nose is white fruit notes such as pear, white peach. On the palate, it's more about the tropical fruits, very soft with a spicy and oaked aftertaste and a nice length. This beautiful light color is due to aging into re-used on oak cask. This beautiful light color is due to aging in oak barrels used more than 4 times and that have been impregnated with the previous alcohol. Reason why, they no longer make coloring. Straight from the famed old Port Mourant double wooden pot still at the Diamond distillery in Guyana. It's bottled at 40% - which some demerara cask strenght indie bottling afficionados will consider a missed opportunity - and, in accordance with Mezan's mantra 'unsugared, uncoloured and only lightly filtered'. This rum has tons of character. Take your average pot still funk and quadrupel it. The aroma is strong! This stuff is pungent. It reeks. Fills the entire room in seconds. You can tell this is dirty alchohol - the opposite of a triple distilled clean vodka really - which retains lots of its original flavours. It makes my stomach rumble a bit and yes it will give you a hangover, as can be expected. That's the trade off for all that character. Because the rum is so complex I find it hard to isolate flavours. Some initial ripe fruit. Pineapple, figs, banana and passion fruit and others things I can't put my finger on. It has more body than the Mezan Jamaica XO which has bold aroma's but a slightly disappointing thin body. This one is more rounded. Long dry finish with just enough oakiness, ends in a spicy bite. All in all its a very pleasant, summery rum that will never get boring. I paid 68 euro's for my bottle. Somehow I find that slightly expensive, I guess I associate that price range and above with more regal, formal, tasting rums. But for a Port Mourant single year, small batch bottling - even though it's not cask strenght - it is actually not that expensive. N: Understated fruitness and yeast. P: Yellow fruit and molasses, with undertones of bread dough. Over all, it's good. It was something different. I'm glad I tried it, and I might even come back to this at some point. Might. 2005 vintage guyana rum at 13 years old it's fruity and well rounded but not sweetened at all. Compare this to the el dorado 12 and you'll really see the difference! 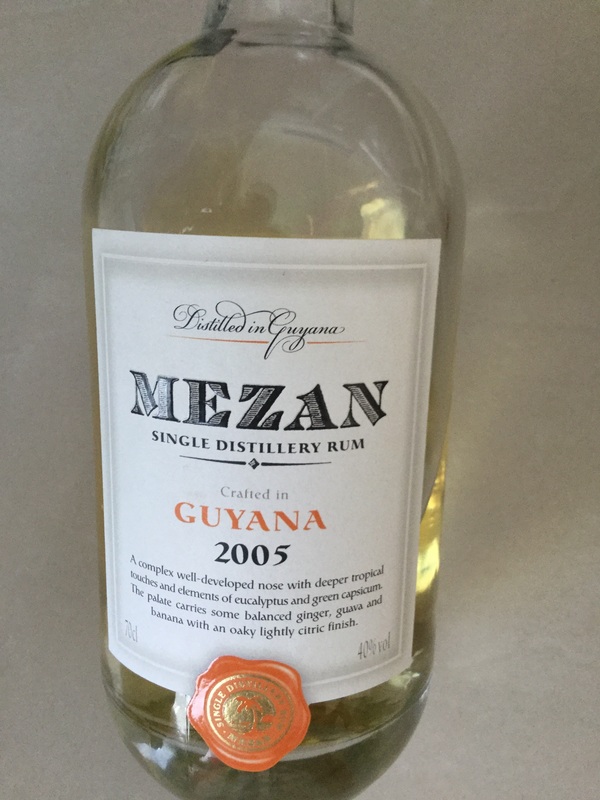 I have tried several Mezan rums, and usually they are rather good, but the Mezan Guyana 2005 edition is very dry, has a rubbery smell to it, looks almost like a silver rum on color, has a very weird floral rubber taste to it finished with a strong burn. Pot stilly, but not too funky. A little cool spice. Creamy. Strong demerara flavor. It's good, but not wowing me. I like this rum but I was hoping to like it even more. I like many rum from Guyana and thought this would be another winner. I like it but I wanted to love it. It is a little raw for me. I am hoping to get to know it better in further tastings. Having enjoyed so many rums with added sugar and color and excessive filtering getting to know this rum with no added sugar, color and lightly filtering may take some time. Rhum étonnamment clair mais qui possède un nez de banane et de vanille agréable une fois légèrement aéré. Le fait qu'il soit distillé "Port mourant" en fois une autre bonne surprise. If you like Demerera rums, this is an absolute belter. The nose, as others have mentioned, is huge and complex. It is the first thing that really hits you, and from there it carries on through to the palate. While the flavours there are big, complex and long, they are also very soft and there is no harsh burn of alcohol, and oh so easy to drink. Guyanese rums aren't usually my first choice, but I like as a change from time to time, but this is one that can change ones opinion. A beast. This stuff is tasty and has it own character that shows there is no adulteration what's ever..